In Zimbabwe wild animals are a business commodity and, as such, they face export. However, this recent case of young elephants being sent to zoos in China has resulted in frantic, well-informed voices raising the alarm. The distressing photographic evidence suggests concerns are well-founded. In his series ‘Africa’ Sir David Attenborough makes it clear that all those involved with wildlife in Africa realise the need for the successful interaction between animals and the communities they live amongst. Footage in the series shows how well the experts understand that on an increasingly crowded continent there is a need for all parties, animal and human, to benefit from living side by side. Part of the ‘Africa’ series is devoted to elephants. The filming shows their social life, their bonding, and the harsh realities behind their survival in Africa. It includes unrelenting close-up footage of a mother elephant watching her calf die from thirst and lack of food. It is heartbreaking but in context. To watch a wild, African-born baby elephant of a similar age try to survive in isolation on the concrete floor of a zoo in China is unbearable. The video clip below is distressing. African elephants are creatures of legend, respected the world over as the largest animals walking on Earth. Zimbabwe’s elephants have survived drought, poaching and political turmoil – they are dignified symbols of hope and endurance. 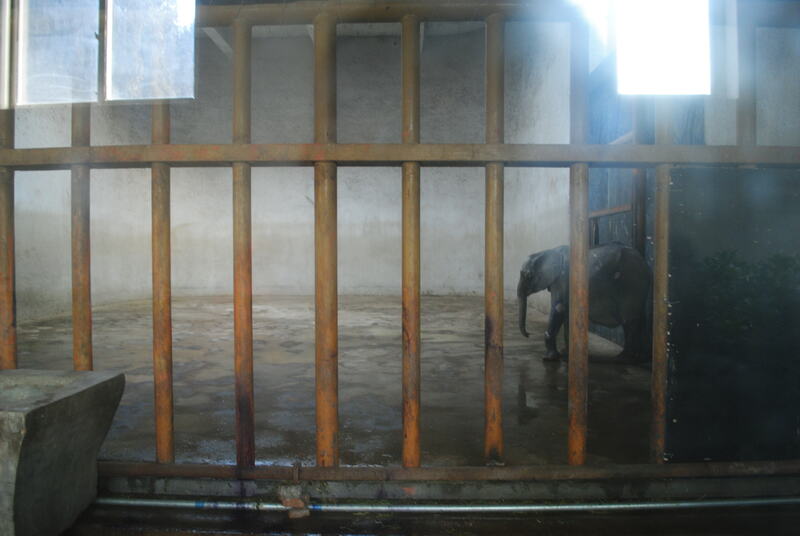 The plight of the lonely, traumatised young Zimbabwean elephant in Taiyuan Zoo should haunt us all. Has Zimbabwe sold its soul? This is a link to an article in The Guardian about the recent capture (2017) of elephants in Zimbabwe. This entry was posted in Elephants, Zimbabwe and tagged Africa, baby elephants, China, live export, Sir David Attenborough, Taiyuan zoo, Zimbabwe, zoos. Bookmark the permalink. what a celebrity has for breakfast, surely enough pressure can be transmitted to the world to highlight this pain and torture to these beautiful innocent creatures. Change has to happen NOW. Zimbabwe tries to keep the deals as hidden as possible … it is such a traumatic situation for the elephants. I’m afraid when you stay at National Parks in Zim you realise that money spent by tourists is going into the wrong hands. Typical of the country. Chalets are mainly empty as people are not keen to stay there due to the poor standards. National Parks was once the pride and joy of this country. It is now sadly not. The only ones benefiting from income via tourists are the bigwigs at the very top. That is why they are needing to sell young elephants – but where will this money go – we know the answer to that! The sale of our beautiful elephants is an evil and despicable act of greed and cruelty. We hope that the right people can step in to stop this terrible situation. Thank you for taking the time to comment – the comments add such value. It is so sad to hear that standards in Zimbabwe’s National Parks have fallen. The only encouragement I can find in this terrible story is that there is real concern around the world about what is going on. Animal welfare groups are determined to raise awareness and find solutions. The more all of us can find out about what is going on and the real reasons behind this sale the better. It would be too awful to discover that the sale of wild elephants into captivity abroad has been sanctioned under the false claim that funds will benefit all Zimbabwe’s wildlife when the real motive is personal greed. This link should take you to another piece I have just posted about the elephants. This is appalling we need to fight these countries this is torture and cruelty beyond words and they rely on us this world is going backwards not forward !!! Thank you for taking the time to comment. It is such a sad and difficult situation. There are people in Zimbabwe who care passionately for their wildlife and are doing all they can to protect the corners they work in. However the decision to export these elephants has been taken at a higher level. The official reason given is that the sale is to raise money for Zimbabwe’s National Parks however, as you say, it feels like an awful backwards step to go ahead with this sale given the fate suffered by the baby elephants sent to China a little over a year ago. The cruelty is clear to us – where institutions are accustomed to cruelty it might not be so clear. I can’t stop crying, it’s horrible what happens to this little one , ant the others, why can we stop this injustice and horror. Thank you for taking the time to comment. This footage is so difficult to watch but it is proof of what can go wrong. I think that we must all continue to speak out about this, to say that the sale of wild African animals into captivity abroad is cruel. In a perfect world the elephants would remain wild and free – they belong to Africa and should be visited there. Sadly it is not a perfect world and Zimbabwe’s elephants are trapped in a country in turmoil. As with all things it takes time and constant concern to make people around the world understand what is going on. We must all keep talking about this as the more people are aware of the price being paid by animals, particularly the wild African elephant, the better. I hope that the YouTube clip I have included at the end of my recent post about elephants will add a little sunshine to your day. This link should take you there. Thank you for your comment. I have heard that of the four baby elephants sent from Zimbabwe to China only one is now alive – three have died. I’m not certain whether this poor animal is the survivor or not. What we are worried about now is that Zimbabwe has plans to export many more baby elephants. Zimbabwe hopes this will help their National Parks raise funds – the concern for animal welfare experts is that young elephants born in the wild suffer terrible stress when separated from their families to be caged and sold abroad. It is very difficult to give young elephants the care they need when being moved and many zoos are not ready to look after them. Elephants like to stay together as families and in sub-Saharan Africa they are free to roam for miles. Here is a link to another article I have written about Zimbabwe’s elephants. Thank you for taking the time to comment. 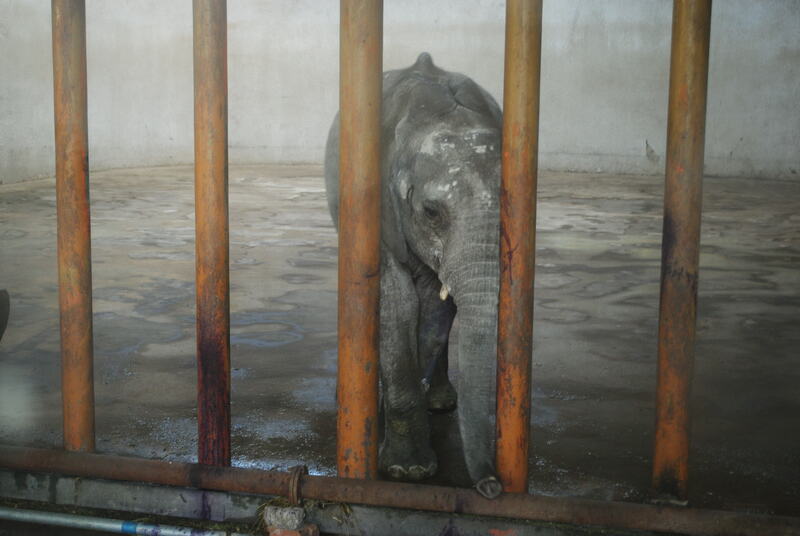 It is terrible to see a confused, baby elephant in such poor conditions and so far from home. Elephants are sensitive animals who like to stay together. They should not be caged like this especially those born into the wild in Africa. Zimbabwe says it is selling some of its elephants to raise money for its National Parks – to me it is like catching a whale from the ocean and selling it on to be displayed alone in a swimming-pool. Zimbabwe’s wildlife is incredible. They should not export their animals but rather concentrate on encouraging us to visit them. It does not seem right that we should take pleasure from seeing an elephant, lonely and behind bars, in a country to which it does not belong. Here is a link to another, more recent, article I have written about Zimbabwe’s elephants. Leave the babies alone! Leave them in their home land with their mother & family. This is beyond words! JUST LEAVE THEM BE! Thank you for taking the time to comment. I hope that Zimbabwe will be able to find some way to keep its wonderful elephants together and at home. I am told that the country is desperate to raise money for its National Parks and that the sale of elephants is one way to do this. The sadness is that the stress of separation is terrible for the young elephants and taking care of them properly can often be too much for the zoos they are sent to. In short it is an unbearable price for the elephants. I am told that three of the four young elephants sent to China have now died. Reports suggest one is still alive but very distressed. Zimbabwe now has plans to sell many more recently captured wild elephants. Here is a link to another, more recent, article I have written about Zimbabwe’s elephants. This is a disgrace. I want to do something but no one appears to know what to do. Can someone at least give the address of the Zoo so I can write and complain. It is very distressing. The following is information provided by Dave Neale, Animal Welfare Director for Animals Asia Foundation. I would suggest visiting their website: http://asiaforanimals.com/coalition-voice/china-zoos-take-wild-elephants. Thank you for getting involved. “Senior Animal Welfare Officer, Lisa Yang has been speaking extensively with the Chinese Zoo Association (CAZG) with regards the ongoing situation for the calf at Taiyuan and about the imports in general. Throughout this despicable episode we have continued to offer to fund a behavioural management expert and a vet to visit the three calves and provide advice and support to the zoos on their immediate needs. While the CAZG are open to the idea, neither Taiyuan or Xinjiang Safari Park are willing to allow us to do this. They say they have the expertise to care for the elephant calves, this is blatantly not true as you can see by the condition of the calf and the fact one has already died. In reality the zoos are simply concerned about further bad publicity. But without the support of the zoos our hands are tied as we cannot access the elephant calves. You may also know that further calf imports are pending, a number of zoos have reportedly already paid the Zimbabwe authorities for the delivery of elephant calves (these are the ones we managed to prevent from being exported) but these zoos are still wanting calves therefore the Zimbabwe authorities are likely to capture more claves for export. The groups in Zimbabwe are monitoring this. The China zoo association’s position on the imports is that it is legal therefore there is no issue for them or the zoo to answer and this should be taken up with the CITES Management authority which is something that we (alongside both Chinese national and international groups ) are also doing. We have been pushing the ethical viewpoint over the legal stance with the zoo association and they do understand our point of view but this is not going to change the zoo directors standpoint for the time being. We are going to look for a way to raise this issue within the zoo directors workshops (which we are invited to attend and speak at) but it is not going to be an easy one as the zoos are likely to see our stance as a criticism of their management. Needless to say it has been heartbreaking to see pictures of this calf going rapidly downhill and having our hands tied to provide some help. We hope that the negative press generated internationally may deter some zoos from getting involved in future deals such as this but we need to keep up the pressure to ensure these deals do not simply slip under the radar. The groups in Zimbabwe are well positioned to get information on future deals with regards the elephants at least. Cant bear to see it…. breaks your heart! I just hope no more have to go.